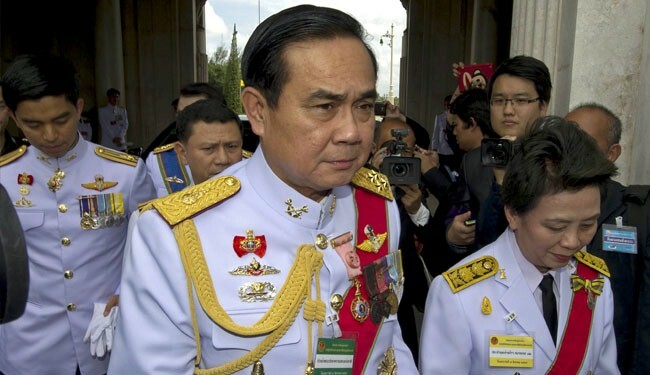 JNN 26 Aug 2014 Bangkok : Thailand’s Army-picked National Assembly on Thursday chose Coup Leader General Prayut Chan-O-Cha as Prime Minister in a one-horse race that entrenched the military’s hold on power. Nobody in the Rubber-stamp legislature opposed the selection of the army chief, who ousted an elected government in a bloodless takeover on May 22. The move by the Top General to shed his uniform and take the Premiership is seen as cementing the military’s control of the politically turbulent nation. The junta has ruled out holding new elections before around October 2015, despite appeals from the United States and the European Union for a return to democracy. Prayut, who is due to retire as Army Chief in September, is seen as a staunch opponent of fugitive former premier Thaksin Shinawatra, whose overthrow in an earlier coup in 2006 triggered Thailand’s long-running political crisis. Thaksin, the elder brother of Yingluck, fled Thailand in 2008 to avoid prison for a corruption conviction. The Army rulers say they want to reform Thailand to end years of Political turbulence and street violence, but critics see the takeover as an attempt to wipe out Thaksin’s influence. The junta has vowed to remain in place in parallel to the future government, which will be nominated by Prayut as Prime minister. He was backed by 191 members of the 197-strong assembly, with three abstentions and three voters absent. No other candidate stood against him. Prayut’s appointment must be approved by King Bhumibol Adulyadej although Royal endorsement is seen as a formality. The army chief, who is seen as a fervent royalist, was not present for the vote because he was attending a military ceremony outside Bangkok. Prayut is often described as the architect of an army crackdown on a pro-Thaksin “Red Shirt” rally in Bangkok in 2010 that left dozens dead. This entry was posted in Jafria and tagged Army-picked National Assembly, Bangkok, Coup Leader General Prayut, King Bhumibol Adulyadej, Prime Minister, Thailand, Thailand Army Chief, Thaksin Shinawatra. Bookmark the permalink.